CREMATORY Release Video for "Shadowmaker"
Germany's leading Gothic-Metal Band CREMATORY has released a video for the new song "Shadowmaker". The video was directed by Dirk Weiler and can be viewed right HERE. "Shadowmaker" is the first taste of new music from CREMATORY's forthcoming album Antiserum and will be available as a digital single shortly. Antiserum is scheduled for a March 2014 release via Steamhammer/SPV in North America. 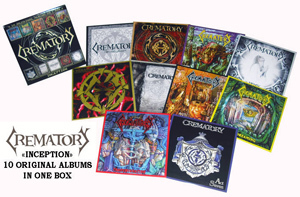 In addition, there will be another special release coming from CREMATORY: a special Box Set named Inception. This set features the band's first ten studio albums in a cardboard sleeve box and is an absolute must-have for all fans and collectors. This set will be released January 21st in North America.